A few weeks ago I walked past the exterior of the old Grand Theatre in Paisley Street and wondered what it looked like inside. Thanks to a reader, Cr Nam Quach, I was introduced to the owner, Footscray businessman Peter Ki, who kindly allowed me inside for a look around and to take some photographs. The Grand was the first picture theatre in Footscray, opening in 1911, but it finally closed in 1987. It then operated as a bingo hall for a while, and still has the (remains of) ‘Fiesta Bingo’ signage on the front, but that too closed before long and for the last several years the Grand has been inaccessible to the public. 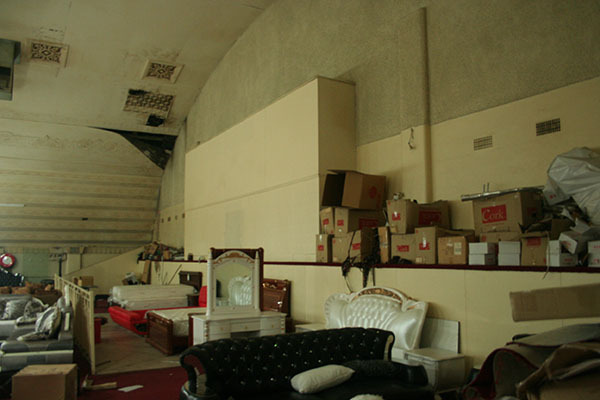 These days, the upper area that once housed the auditorium is used as a storage place for furniture, for one of the shops on the ground floor. All the original seats have been removed. The presence of those sofas, beds and mirrors gives the place a slightly surreal feeling. It wouldn’t be bad to lounge back in them and watch a movie. There’s some damage to the interior, but overall the space is in pretty good shape as far as I can tell (unlike other old cinemas around Footscray such as the Barkley). It’s possible to imagine it could be revived in some form, if not as a cinema – who knows? I imagine that artists, performers or craftspeople might be able to make use of the space as a gallery, rehearsal or performance area. It would be nice to imagine that it could have some kind of new life beyond furniture storage. The building apparently has some kind of heritage protection, but parts of it may still be developed one day. I’d prefer to see it as an arts space myself. The interior of the Grand does not seem to have been particularly elaborate or lavish but it features some pleasant decoration. I’d love to get hold of some interior photos of the Grand in its heyday, but I haven’t found any yet. The projectionist’s box still contains just a few bits of equipment. It would be great to hear from anyone who has a particular interest in old cinemas and can explain how it worked, or anyone who remembers seeing a film at The Grand and has memories of it. Looking across the auditorium, where the stalls used to be. 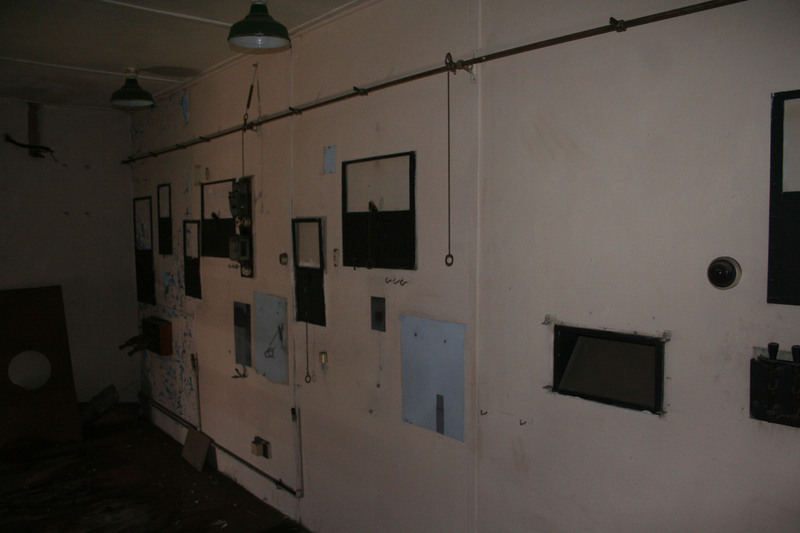 The projection box is behind the panel on the right. Looking from the back of the auditorium towards where the screen used to be. The cinema actually extended a little further forward, the screen was beyond that far wooden panel. 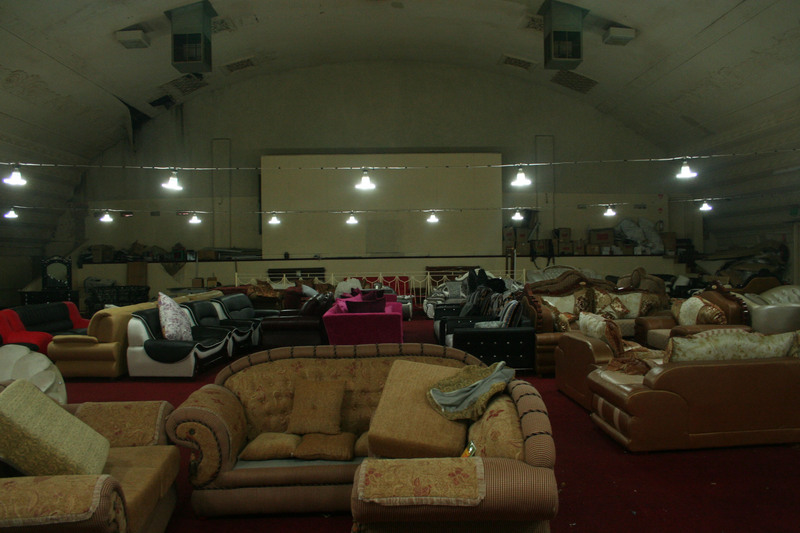 Looking from the front of the cinema towards the projection room at the back of the auditorium. 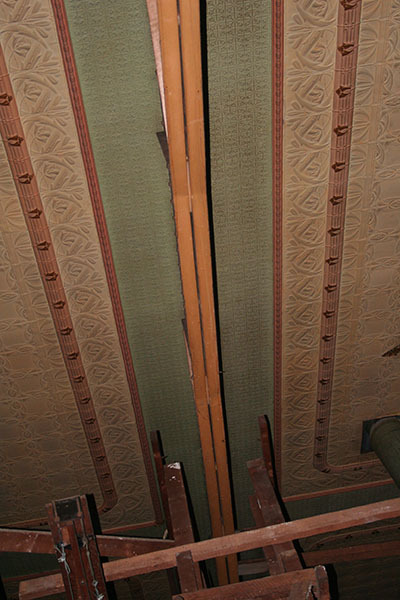 There are some Art Nouveau-ish touches on the ceiling. There are other decorations here and there, but the space was more functional than ornate. 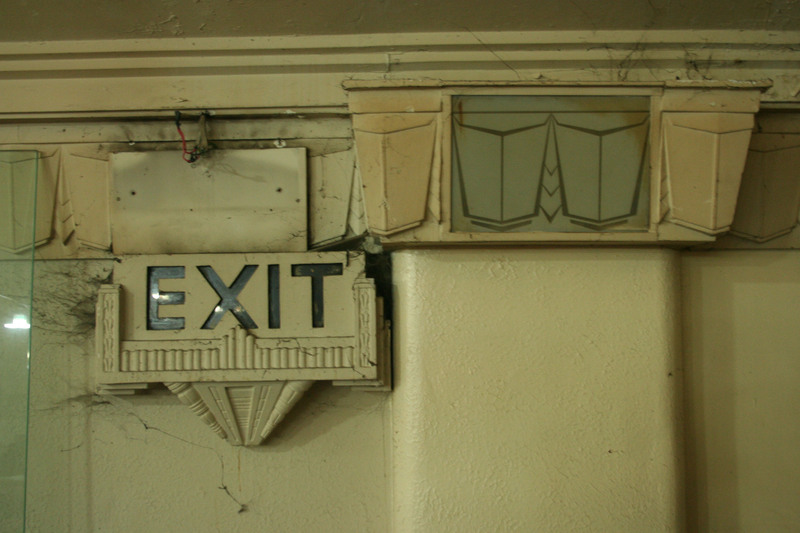 A touch of decoration on the lights and exit signs. The projection room was behind those boxes. Water damage is evident but not terminal. 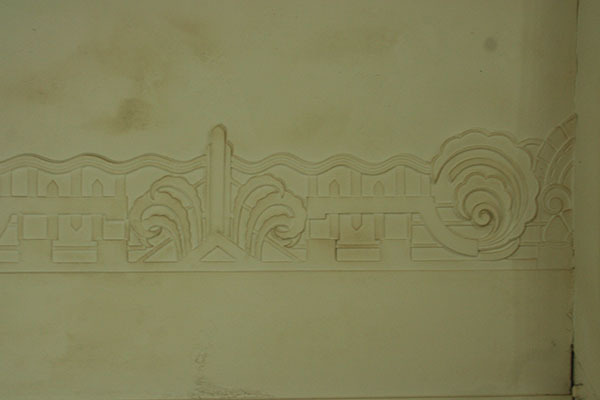 This surviving bit of coloured ceiling – painted or papered? – is behind the panel at the screen end of the cinema. A seat in the stalls. 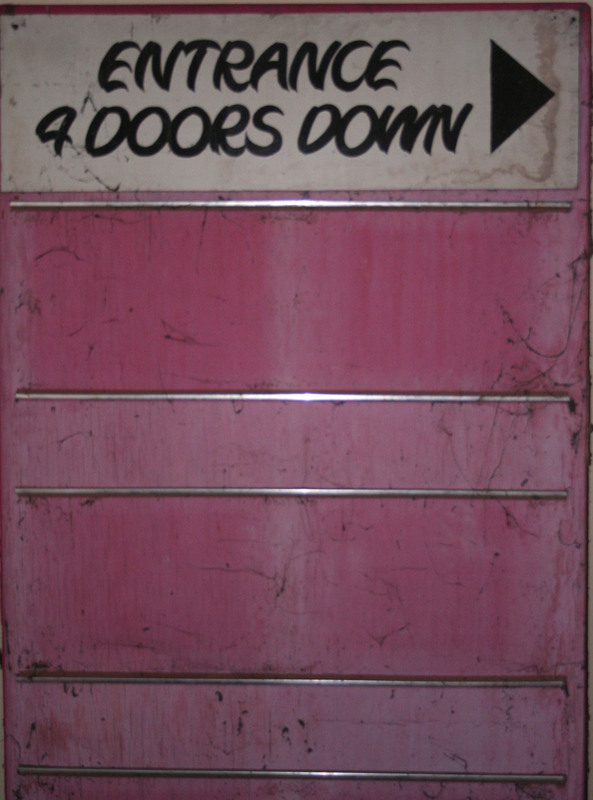 Did this sign belong to the cinema, or the bingo hall? Peeking into the projectionist’s box. 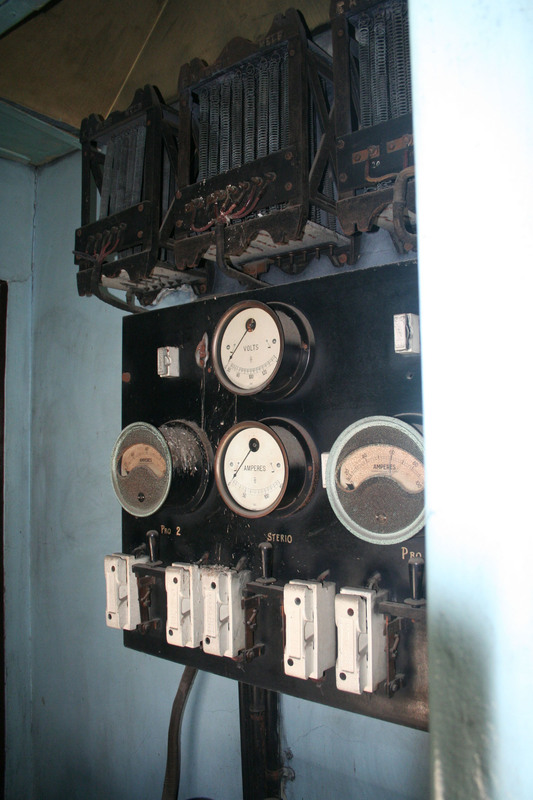 Inside the projectionist’s box is one of the few remaining artefacts that proves this place was a cinema. The text reads ‘House lights, Borders, Footlights’ . 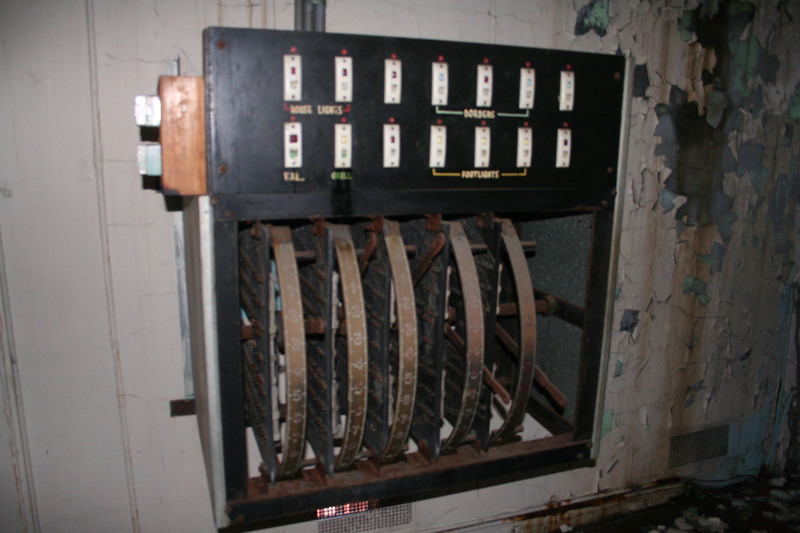 Another bit of the projectionist’s equipment, presumably for controlling the power for the light and sound. I assume there used to be a lot more projection equipment on this wall of the box, which faces towards the screen. 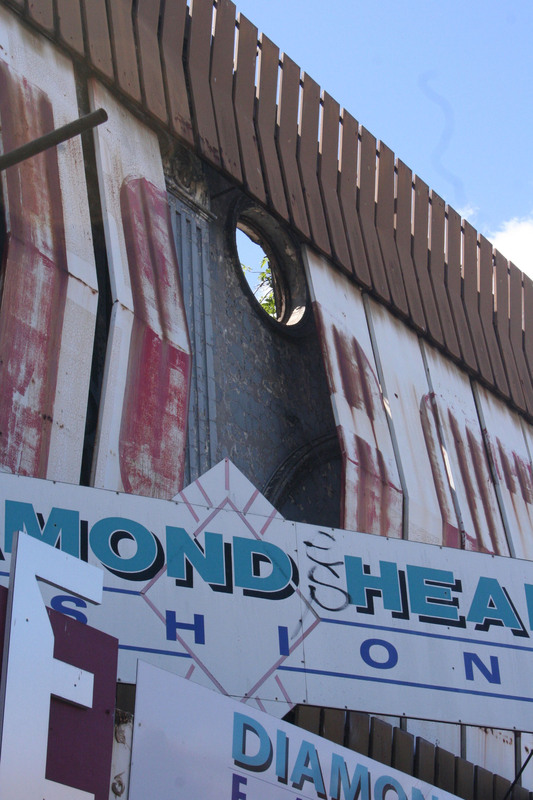 Behind the disintegrating bingo signage, the facade of the Grand is visible. Apparently there used to be a design on it, which was later painted over. Here’s my previous post on the history of The Grand and other Footscray cinemas, of which there were several. (“The lost theatres of Footscray“). Like stories of lost suburban Melbourne? Check out our other stories by suburb. Follow Melbourne Circle on Twitter. Looks like you’ve had a grand old time exploring the old Grand Theatre. Nick. There’s bound to be a historical society dedicated to old theatres, that could answer your queries. There’s a cinema history society that I’m sure would love these pics. They’re called CATHS. Can I ask is there an upstairs foyer at all? Did you get any photos of this? Great to finally see inside. I had wondered what it would look like on the inside many times. Thanks for posting. Thank you Anthony, glad you like the pics and that I could satisfy your curiosity about the Grand. No, I didn’t see an upstairs foyer. Just went up the stairs and straight in. Thanks Jane, good idea! Alternatively, it could make a really good arts space/gallery. And congrats on your blog, it’s great. And congrats on this! http://seizureonline.com/viva-la-novella-3-the-shortlist (and to myself of course too). Hey thanks Jane! And congrats right back at you. and spent many a Saturday afternoon there. The ticket box was at the bottom of the stairs, then you went up the stairs to the candy bar before going into see the movie. If it was a popular movie you had to leave down the stairs next to the screen and came out a few doors down. The one thing I reslly remember was the egg cartons on the walls (well thats what they looked like) to assist with the sound. Thanks for sharing those memories David! One thing I remember about the Grand was the poor quality of its sound system.I took my sons to see Superman there and you couldn’t understand a word. We only went there as a last resort because of the poor sound. We used to go to the Trocadero which was around the corner in Barkly Street just before it became Hopkins Street. Or we went to the Barkly Theatre near the girl’s school. Plenty of choice those days. Oh no! Not much of an experience if you can’t hear the dialogue. I’ve been thinking for ages his place needs to get used as a venue quickly before it gets turned into apartments like every other big space in central Footscray. How about we should do a week of events in there for Big West? We could hire some storage space nearby for the furniture in there to go temporarily, or maybe leave the couches for surreal seating… I have a full size sound system suitable for bands with subs and and projector for films… Anyone else keen? BTW I think there’s a space to the left of the stairs at the top (behind another partition) that might have been the candy bar. 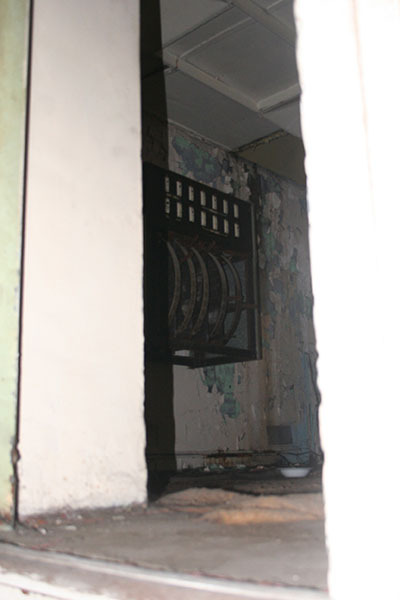 The ticket booth is still at the bottom of the stairs. My Mum used to go there and worked as an usherette I think at the Barkly. Grandad did the bingo. It’s awesome. Great idea Richard. I think the owner might be open to that idea if the furniture can be housed somewhere. My family went there a few times in the 70s and yes up the stairs was the candy bar with cordial drinks, jaffas and fantales on sale before entering the cinema. I used to stair at the walls inside and realised they were painted egg cartons. There was music pre movie and intermission which later I identified as the Shadows. Most interesting to see these pictures of what was “The Grand’. For 18 months I worked around the corner as assistant projectionist at the Trocadero – my first movie job. I visited the Grand a couple of times and remember meeting the projectionist, a nice old guy called Clarrie. Does anyone remember him? Great to hear from you, Harold. Can you explain a bit about how things worked up there in the box? I must admit I don’t have any idea how the bits of machinery I photographed actually made the film appear! Hi again, I’ve just begun to follow up on my idea to have a temporary Big West venue in here for 2015, so stay tuned. If anyone wants to help or be involved, click my posting ID and it will take you to my FB contact hopefully, or just email me richie@r23d.com . Anyone out there have a contact for the owner Peter Ki? Hi Richard, Peter is the owner of the fashion shop at street level on the Grand Theatre building. I think it’s called Diamond Head fashions. Call in and you might catch him. Unfortunately not. Wish I had! I run a pop up / mobile cinema and would love to get involved in reviving an old theatre in Footscray as I love doing these projects and I have all the gear. I saw many a movie there with my brothers and sister. A real Saturday outing for us kids. My first teary movie was seen there- Romeo and Juliet. I was about 13. Does anyone remember the lady who served all of us kids when it was intermission and we all ran out to be first in line ? She was a bit of a sour face and grumpy lol. And if you sat at the back in the stalls you were pretty cool . But if we mucked around the grumpy lady would tell us off. Hi Nick, I was studying at night school at Footscray Tech in Ballarat Rd in the mid to late 1960’s and one evening after class, I made a special effort to see The Time Machine with Rod Taylor at The Grand. Most likely a 7.30pm or thereabouts session. Unfortunately I am unable to remember anything specific about the theatre’s interior except that it was upstairs and I don’t think many patrons were in attendance. However, I was glad and still am, that I made the effort that evening. Thanks Lindsay! It would be good to hop in a time machine now and see the Grand in its heyday. I walk past this place every day, Ive even photographed it, and never suspected its original purpose. Thanks for the insight. Yes, it’s hard to guess what it used to be from the way it looks now! Thanks for reading and commenting. 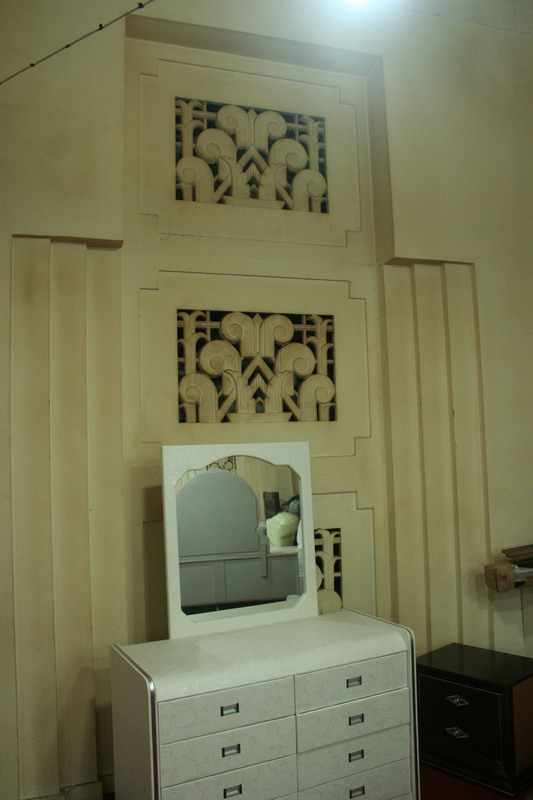 Could somebody please refurbish this beautiful piece of history. Imagine, to open this establishment again with a bar opening out onto madden square before seeing a movie. Would be afantastic addition to western suburbs cinematography. remember the place well, Jan and Cyril McCarthy used to run it, i believe it was Jan’s mum that used to serve in the shop. Brian Davis (still close by in Yarraville) was the projectionist i believe. 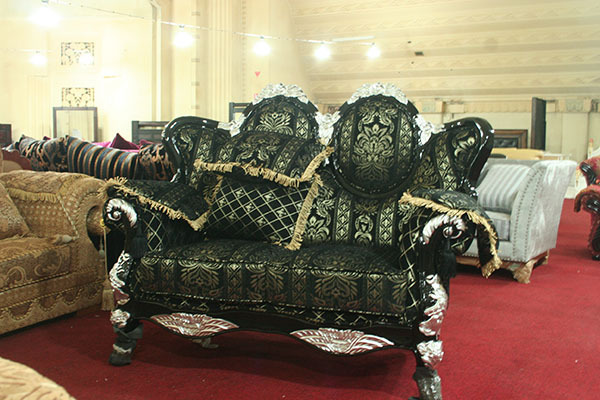 The “House of Dreams” lowered to a furniture store. Not a lot of dreaming there now. Our youngsters do not realise just what they have lost. Geo.K.